I’ve been in a creative mood lately, likely the result of producing and distributing my documentary last week. That was such a step outside of my comfort zone that it seems to have broken down the stone dam blocking my creativity; everything is rushing out in a flood. The last few days, I’ve been really inspired to write flash fiction. 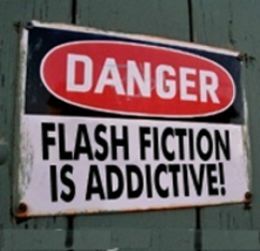 If you’re not familiar with the term, flash fiction is basically a super short story written as quickly and as efficiently as possible. While I never heard this term my first time in college, flash fiction seems to be one of the major buzz words in the literary industry [and educational system] right now. I’ve submitted both to contests, but I’ve decided I’d take the risk of being disqualified and share the short one here, mainly because I’m curious as to how everyone will receive it. Can a story under 100 words truly convey all of the same features and emotions of a longer one? Can a hero’s journey really occur in a single paragraph? The kite tugged, held captive between chubby fingers coated in sugary loam. Silk paper fluttering, it dove beneath the wind, turning cartwheels across an azure sky. The eastern breeze blew, whipping the delicate crepe basilisk into a frenzy of color. Even the most tenacious of sticky fingers could not contain the power of a wayward wind, and so released the truculent string. I believe that came in right around 65 words, not counting the title. It was an arduous task to write this, mainly because I enjoy descriptive language and narrative so much that I could spend three paragraphs describing the kite alone. Truncating a story into five little sentences… it was torture. However, I feel like each sentence carries a lot of weight. Every word was chosen with care and I feel PROUD of the piece, something I rarely feel with most of my writing. Does the act of being economic with my words increase their value? I’m optimistic that it can. ← The world is full of GOOD people.